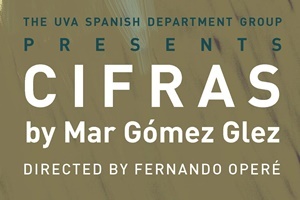 From February 15th to the 17th at Helms Theater, the University of Virginia Spanish Theater Group will be presenting its production, in its original language, of Spanish playwright and novelist Mar Gómez Glez's Cifras. Cifras is the latest production by the University of Virginia Spanish Theater Group and Director Fernando Operé, who with the help of graduate students and faculty, has been enriching UVA and the Charlottesville community with performances in Spanish by Spanish-speaking playwrights for 37 years. Don't miss out on this unique theater experience! All seats are general admission, and tickets are $5 for students and $15 for non-students. Please note that there is no late seating, no intermission, and no readmission for this production. Doors will open 30 minutes prior to curtain and you must be seated by curtain time.